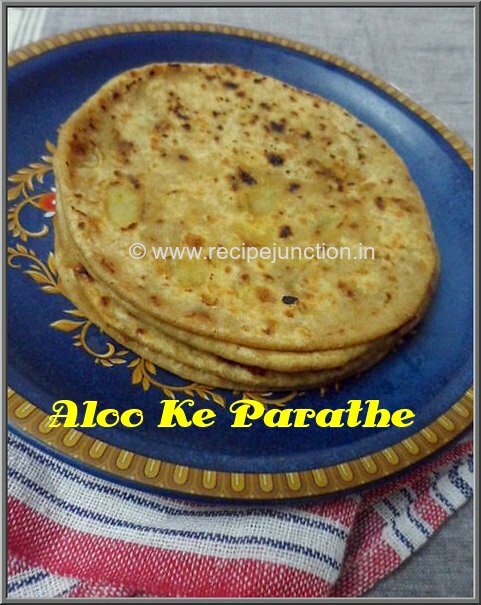 Aloo Paratha, The most popular and beloved Punjabi paratha recipe which has won millions of hearts of Indians and also foreigners just simply by its taste. 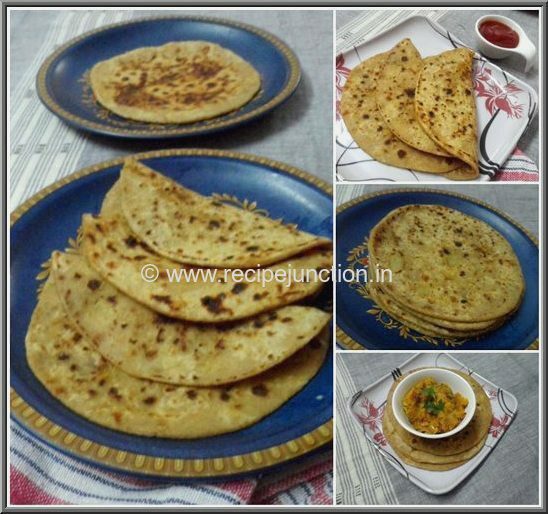 It is a staple breakfast dish not only in North India but also among other parts of Indian people.What makes these parathas so appealing is the tasty filling of potatoes flavoured with onions, ginger, green chilli, tomato and some tangy spice powder like amchur or dried mango powder or just with simple lemon juice. Oil (any white oil) : 1 tblsp. Amchur/dry mango powder : 1-2 tsp. Making Dough :: At first, mix the flour with salt and oil for couple of minutes. Then add enough water(lukewarm) to bind the flour and make a soft dough. Cover and rest the dough for 15-20 minutes. Making the stuffing :: First, boil the potatoes till just done, do not overboil the potatoes. Cool and mash it well. Now heat 1-2 tsp. oil in a pan, temper it with cumin or ajwain seed(you can also omit the tempering), when seeds turn brown, add sliced or finely chopped onions. Let it change its colour, then add chopped green chillies and tomatoes. When tomatoes softens, add all the spice powders and ginger paste, mix well and add mashed potatoes in there. In medium heat, saute the potato mixture till there is no moisture left and everything mix up well. Season with salt. Lastly you can add some chopped coriander leaves if you want. Stuffing is ready, keep aside. 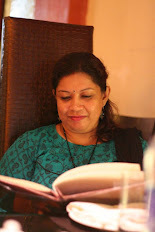 Rolling Parathas :: Now knead the dough once again and make equal sized balls from the dough. Take one ball at a time and on a dusted flour, roll it out into a small circle. Place 1 big tblsp. 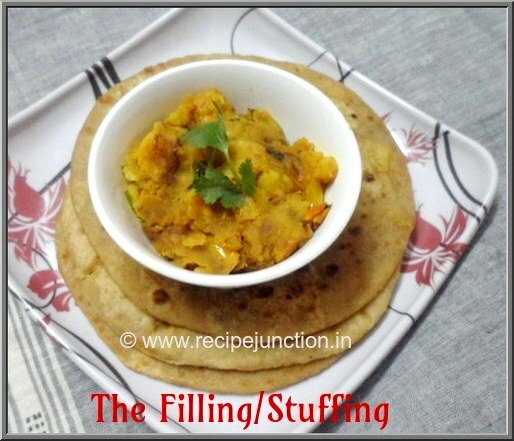 of stuffing, sprinkle little flour over the stuffing(this helps in rolling the parathas and prevents it from breaking while you roll further) and then gather all the sides and make a ball again. Tips :: the quantity of stuffing depends on the size of the dough ball you make. Do not put much stuffing. Now again dust the floor well, carefully spread the parathas little at a time. Tips :: Do not press too hard while rolling, then stuffing will come out from inside. 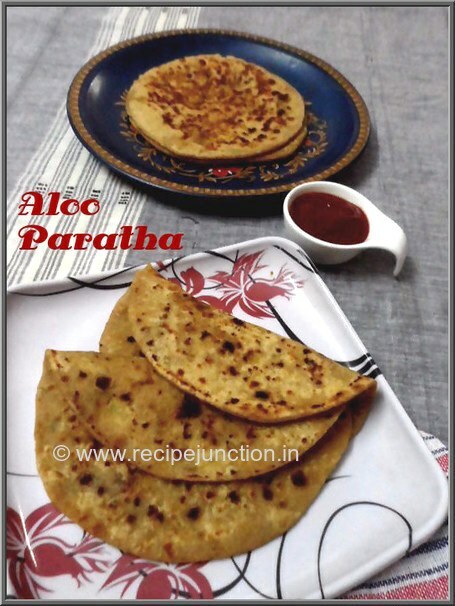 Make other parathas similarly. Frying the Parathas :: Heat a tawa, place a rolled out paratha on the tawa, let it cook a little from both sides without adding oil/ghee, then brush oil/ghee on both sides and fry till they are golden brown. Tips :: Fry the parathas in medium heat, otherwise parathas will turn hard. Enjoy and fall in love with it !!!!!!! Bon Apetit ! !